The tablets will bolster the immune factors important for the control and prevention of cold sores. Those with occasional problems may use the tablets with the ointment when experiencing an outbreak in order to hurry healing. 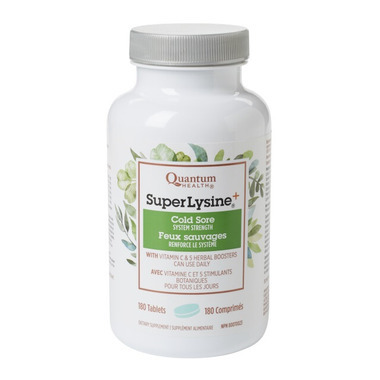 For long term management or severe circumstances, many use the Super Lysine Plus+ Tablets on a daily basis. Ingredients: Three Tablets Contains: L-lysine 1500mg, Vitamin C (Ascorbic Acid) 100mg, Garlic (odorless) 200mg, Echinacea Extract (4:l PE) 100mg, Propolis 50mg, Licorice Extract (4:1 PE) 15mg, Goldenseal Root USP (Hydrastis) 15mg. After many years of prescription creams for cold sores I finally found Lysine! It works wonderfully. I only need to take the pills and use the Lysine lip balm for a few days and the sore disappears. Wonderful product and speedy delivery. This product works really well for me...prevents cold sores as long as I take them as soon as I feel a tingle. The delivery was quick, thank you! This brand of L-lysine is the only one that seems to work for me. It keeps cold sores at bay if I take it at the first sign of an outbreak. If I don't take it soon enough, it still speeds up the healing process. I don't know if it will work for everyone, but I swear by it!! !